October 4th - Attended Madame Chrysanthemum's one year anniversary party with M and L. The cupcakes were sublime. October 5th - Got the day off from work so I could check out the Junior League Thrift Sale at the Civic Center with M and C. Unfortunately the lackluster sale was not worth getting the day off for. First, you had to pay to get in. Second, was the annoying people wheeling suitcases around making it impossible to make your way in any direction. And third, the only clothes were for children and women with child. At the end though, I discovered the area where various stores around town had donated new items. Only there did I find a few trinkets. After the sale C and I went to Broughton St. to check out the shops. Then on to lunch at Soho South Cafe. October 7th - Picnic in the Park at Forsyth Park. We sat on blankets, sipping wine, nibbling cheese and crackers, while a symphony played on stage. The perfect October evening. Numerous ambitious and clever groups of people had taken the picnic theme to a whole other level. Bringing real tables, chandeliers, and even dressing up. All in hopes of wining the Picnic in the Park contest. Michelle from Madame Chrysanthemum and her friends ended up taking home the prize, their Wizard of Oz theme was a hit. October 8th - Went to peruse the SCAD Alumni Design Show House with L. There were rooms I just abhorred and rooms I adored. I was annoyed no pictures were allowed to be taken. Or at the very least they could have provided pictures of the transformed rooms in the catalog, but no. October 10th - Saw David Sedaris read at the Civic Center with M and L. He read from the book he's currently working on. He looked quite different than I imagined. My only qualm with the reading was that it should have gone on longer. Oh, and he made the hugest of faux pas by stating that Savannah was in South Carolina. The locals were not happy with that. But really he should know the geography of the south east better. He did grown up in North Carolina. Didn't get anything signed as M and L seemed impatient to move on. We ended up at Lulu's Chocolate Bar for dessert and drinks. October 11th - Went to a party with M at Clipper Trading Company. The food was delicious. The highlight being the bananas wrapped in bacon. October 12th - Saw The Jane Austen Book Club with M. Liked it enough. October 16th - Attended a reception at the Jepson for Philip Morsberger with M. As the evening wore on we were sitting on a bench debating where to go for dinner when a lovely older woman came and sat next to us. Turns out it's Morsberger's wife. Before we know it she's introducing us to the man himself. Quite the thrill. Then it was on to dinner at Local 11 Ten. October 20th - Wag-O-Ween. When all the multitude of dogs in Savannah are adorned by their owners in the most adorable costumes. Then all the stores downtown lure the dogs in with treats. An event not to be missed. October 24th - Spent the day with S on Hilton Head Island. Bit rainy, but had a nice day nevertheless. Would like to go back and spend the day at the beach. October 26th - While at work, who do I spot out the window, but Michael Douglas, Catherine Zeta Jones, along with their two kids and a nanny. I must say, in person, CZJ is stunning and honestly MD really isn't that bad looking either. Michael has one of their boys on his shoulders in a really endearing way. They were in town for the Film Festival, so I shouldn't have been so shocked to see them. But what was so surprising was that there were no photographers chasing after them, must be refreshing. Later in the week heard through the town gossip that he was a dear but she was not. Pedicure after work with K. Then, and this is where it gets weird, went back to the store we both work at to meet some paranormal experts who think the store is haunted. So, apparently the owner of our store was approached because a paranormal expert who happened to be walking by felt a presence inside the store. The owner claims she herself has often felt the presence of a "ghost", so she agreed to allow an investigation to take place. K, her boyfriend, and I met the two couples at the store who were going to conduct the investigation. They had their cameras, their tape recorders and were ready for business. The asked us to turn off the lights and talk in our normal voices, no whispering. So we parked ourselves at the counter while they conducted their investigation. Which involved speaking to the "ghost" and taking photographs. We try our hardest not to burst into laughter while overhearing their questions. Questions like, "so I hear you like music?". Apparently the store, which originated as a dairy, was once a piano shop. Then we got scolded for talking too loudly. After several hours passed, the experts leave, telling us they'll be mailing the results of the investigation. From there it's on to Wild Wings for dinner and drinks. October 27th - Whitney Gallery exhibit opening with L. Liked the space. October 28th - Went to Shalom Y'all the Jewish Food Festival at Forsyth Park with M. Great food and another celeb spotting. This time it's Illeana Douglas, who I just adore. Again, no photogs. 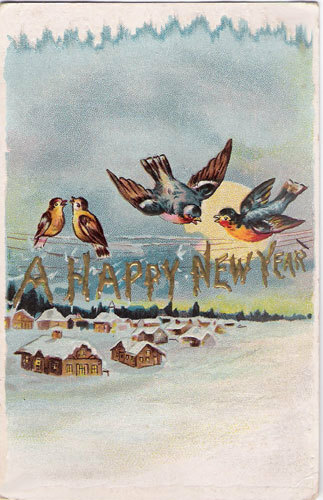 For next year, remember to go earlier, as food runs out. October 29th - Director of Fatal Attraction, Adrian Lyne popped into the store. He was road tripping from California to the East Coast with his family. November 1st - Saw the stage version The Rocky Horror Picture Show with P. Quite the evening. November 2nd - Katie Lee Joel (Billie Joel's VERY young wife) does some shopping at the store. Went to the Film Festival with P, saw The Savages. Liked it quite a bit, then on to Leopold's for ice cream. November 3rd - Telfair Art Fair with L. Met the artist Mary Hartman whose painting I bought from Madame Chrysanthemum's. Film Festival with M. Saw Romance & Cigarettes in the afternoon. So good, the singing, the dancing, the homage to redheads. In the evening saw Charlie Rose accept an award, then got to sit in the VIP section to watch the Kite Runner, which was, of course, intense. Went to after party. November 5th - Attended The Art of Great Fashion fashion show at the Telfair Museum with S. Amusing. My old downstairs neighbor was surprisingly one of the models. Then on to The Sapphire Grill for a light dinner. Must go back for a proper dinner. Bartender was v. cute. November 9th - Working Class Studio trunk show with L. Bought yards of Savannah Toile at cheap cheap. Italian for dinner with M.
November 17th - Day of Mutation Craft Fair. M was a dear to help me man the table. Split my table with a girl named Kayla of Just Like Sew who made quite nice things. 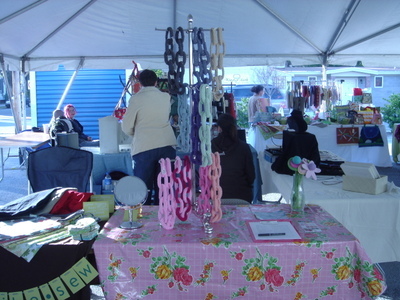 Was off to a great start when I sold my first scarf before the fair even began. There was a nice turnout as the fair also coincided with last day of the farmers market. Saw people I knew, such as A, who I used to work with at the Jepson and L stopped by. Sold a fair number of scarves. Met some talented crafters. There were various things I wanted to buy but as the whole point of the fair was earing money I tried to curb the urge to spend. Grabbed lunch from Nita's and dessert from Back in the Day Bakery. November 18th - Received an Email from a girl who tracked me down via staff at the Mutation Craft Fair. She went back to the fair wanting to buy 4 of my scarves, not realizing I was only attending one day. Made arrangements with her to make custom scarves as Christmas gifts for her family. November 22nd - Went out for Thanksgiving brunch with M and L at the Hyatt. Then later on to dinner with P and her family. Had the nicest time. Didn't have to provide any of the food, as they eat gluten free, but did bring very nice hostess gift. The food was superb, despite the lack of gluten. A couple from Nashville showed up. The husband is working with several singers in Nashville, writing and singing on their newest albums. He played a few tracks for us. Saw C, from the Jepson, who I hadn't seen in a while. Then had to rush off to go see a movie with M. Thanksgiving turned out nice despite not being home with family. November 23rd - Paula Deen put in an appearance at our store. Now it's sort of this running joke at the store that Paule Deen claims our store is one of her favorites yet she has not once ventured in, in the 9 months that I've been working there. She's featured the store in her magazine, her television show and we're even on the Paula Deen tour. So she finally comes traipsing into the store as we're getting close to closing with a pal of hers. She's friendly enough. But not like she is on her show. She's much more subdued. Mostly she buys Christmas ornaments and then she's off. Out of town for a month she tells us, in case we need to reach her about a special order she's place. 'Til next year Paula.